A style is never objective, it has and will always be subjective. Whatever one wears – from clothes to accessories, defines the personality behind these. It always carries a tinge of reflection of what you are that a negative feedback is not easily digested. However, the best way to keep up the look that everyone admires is to follow simple thumb rules to inspire a closet. From a man to a woman, the wardrobe signifies a lot about the lifestyle of a person. Maybe, that is the reason why big fashion brands want to explore the wardrobes’ of every celebrity. To have a killer look, all you need is a good pair of jeans, with a couple of right-size shirts, and a few pairs of shoes that match to this look. Apart from this, other things can be neglected by the audience. To get your look right, you need to feel comfortable in whatever you are wearing. Also, the way both the genders dress up and find comfort in, differentials in a lot of manners. Have you ever wondered, what impression do you make when you wear a pair of jeans and a T-shirt for a formal occasion? Well, it does sound odd, right? For such occasions where you need to dress up like a pro, opt for the blue colored two-button suit. Blue is the classy color that gives an amazing look to your entire aura. And as we know, blue represents men. Therefore, you would find no man on Earth who does not need this in his closet. It is hard to say, what number of ties must a man have in his closet? The more the better. Have a tie for every pair of suit you have in your wardrobe. Choose from various patterns, colors, materials, etc. Pairing a single tie with everything can be too boring and outdated. Keep your look fresh as a daisy by pairing the suit with the best ties that you have in the wardrobe. Have you found yourself struggling to remember where you kept that extra button of the shirt that you wanted to wear today? Well, sadly, we have been there, isn’t it? The closet is a home to any of these extra yet vital things. 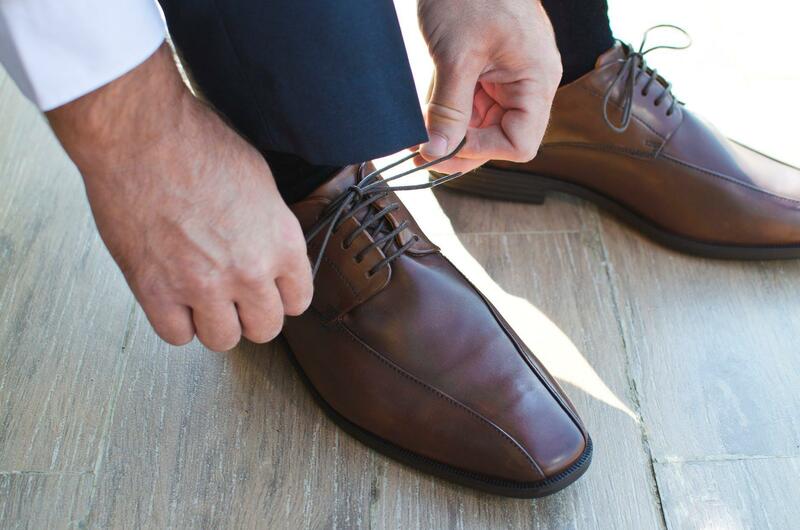 From collar stays to shoe horns, anything can be needed anytime and that is why you need to have a room in your closet for these. Another basic yet vital element of a man’s wardrobe – the white shirt. For all your formal occasions, nothing suits the best as compared to a white color shirt. No matter how many shirts you own, if you do not have a white one, your wardrobe look is incomplete. The best thing about having a white shirt is, it goes with any formal occasion. From a courtroom to a wedding reception, nothing makes it odd. Generally, the society considers a man the most responsible breed. Unfortunately, when it comes to safety put his belongings in place, we fail. Why struggle every morning to find the car keys, car documents, handkerchief, etc before you leave the house? Make some room in your closet for all these things so that as soon as you come back in the evening, you put all your stuff in one place. It actually saves you from all the morning struggles. Who could have ever thought that the loafers can be a part of a man’s look too! The biggest advantage of having a pair of loafers is not to worry about the shoelace. These can easily be worn and taken out. Another interesting thing about loafers is, you can wear them with formals, casuals, and semi-formals to pull=off your killer look. Just keep in mind to choose a color that fits with everything. Apart from these segments, the accessories a man wears along with these makes or break his entire look. Following are some accessories that a man should always have in his closet to make his life simple yet attractive. For men, usually, a watch is the only accessory that they prefer on their wrist. However, what kind of style you want to pick for your wrist, depends on your preferences. Some like the metal strap and some like the leather strap. Occasions decide the look you want to wear. It is great to have one watch that goes with every attire rather than having an unlimited collection of underrated quality. Do you think killing your amazing look because of a bad watch is worth the stakes? Men do not like to clean or buy a new wallet for years. Males do not like to replace or unclutter their wallet just for the sake of time they will waste on it. However, imagine, you take out your wallet to pay at a fancy dinner but your wallet looks too shabby that you feel embarrassed. Well, why keep something in your pocket that you regret taking out in public? Purchase a wallet that can keep all your documents and money in their place. Another way to keep yourself organized with an accessory is via money clip. If wallets are not your thing then opt for money clips. Carry your money just like a pro in your pocket. Also, if you want to carry a hot look along with a money clip in your pocket then go for a gold chain for men to choose from a variety of options that perfectly looks amazing with the accessories you carry. How do you carry all your expensive utilities with you whenever you travel? Why not have a classy bag with you to carry all your belongings? A messenger back is a sign of elegance and can be used to carry all the items that seems valuable to you. The good news about messenger bags is that you can pick any color and size for you. You can pull off any look when you have a sassy bag. What happens when you see a tacky color pair of socks in the feet of a person who is wearing a formal suit? Your whole perspective for that person changes, isn’t it? Well, sad that people do not know what role does a pair of socks have in a man’s life. Wearing the right colored socks is an art that only a few men can master. In fact, the material matters a look too. Generally, people think a scarf is an accessory for women. However, fortunately, it isn’t? Pear a trendy scarf with an outstanding jacket and ensure you keep yourself warm and classy during the winter season. However, the way you drape it will actually kill the look. If you open your closet today, how many belts would you find in it? Well, there may be a few, right? Men have a habit of collecting a range of accessories that they love the most and the belt is one out of these. However, is it worth to have n number of belts that do not even fit well for any occasion or for that matter with any outfit? Certainly not! Instead, buy a leather belt that will go with any attire but it ought to be top quality. Well, this is the second best accessory after watches that most men have. It not only protects you from the UV rays but also adds a stylish look to your personality. Luckily, the style is not limited and the brands provide options that men cannot even count. Choose a quality pair of sunglasses and enjoy the look you want to carry for any occasion. Cufflinks are not for a casual look. These go well with a professional outfit. In fact, when wearing cufflinks, people get an idea that it is about the business that you want to talk. The amazing part of cufflinks is you can get these customized. Also, they are available in various styles. Are you a travel lover or a nature person? If yes, then these two accessories should be in your closed all the time. Hats and caps keep your dust free and keep the sun rays at bay. But we all know they do more than that. If you need to choose the perfect pick for you, do not worry, a plethora of options are available in the market. In the end, nothing can help a man look best until he knows how to be comfortable in what he is wearing. How you carry yourself with confidence will help you make you look amazing. Even if the clothes and accessories are branded and you do not know how to handle them, the total appearance can be a big flop.